Based on the work of philosophers like Luhmann, Maturana, and Förster, the Viennese System Thinkers look at organisations as living social organisms, and ask what the implications of such a view are for how to lead, manage, and change organisations. You may only make assumptions about what is needed and act accordingly to achieve the outcomes you hope for. The consequence is that you can’t plan a change initiative, or any other action for that matter, as a long term linear process. You need to engage in action, see what happens, and adapt your next move based on the outcomes achieved and the reaction of the organisation. This doesn’t mean though that you should act arbitrarily. 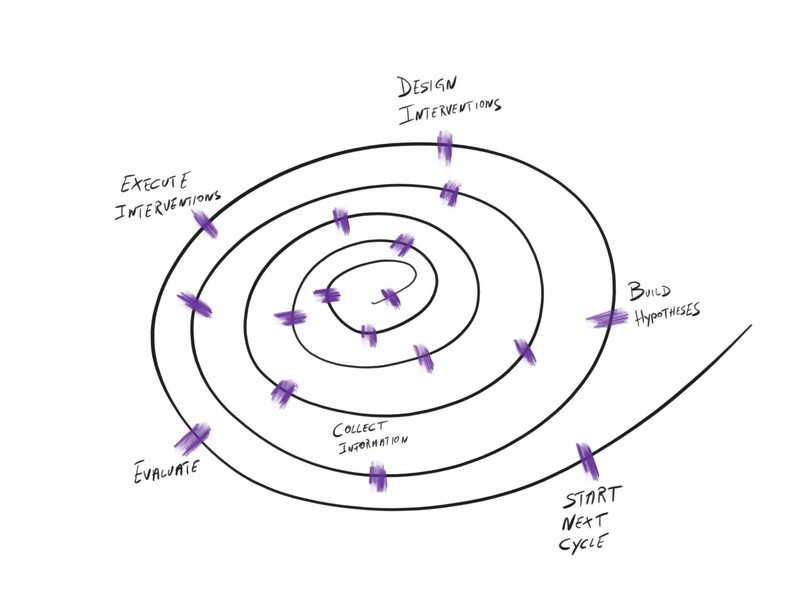 The Viennese System Thinkers have a practice called “The Systemic Reflection Loop” to give such an agile and responsive approach to change, transformation, and management, structure. The organisation as a living organism will interpret and react to these impulses in its own way. Interventions should be based on hypotheses regarding the situation, the specific context, and the intended outcome. At the same time one shouldn’t cherish the illusion that the intended outcome will occur. This Systemic Loop can be applied on the macro, as well as the micro, level of leading change. On the macro level, it should be applied to reflect on the overall process and big picture. At the micro level, it’s applied to daily activities and interventions. For change and organisational transformation, this means the following. Before you engage in any activities, even start planning activities, gather insights on the current situation. Talk to people leading the change, as well as those impacted by it. Ask them about what they know about the change, how they feel about it, what’s on their mind regarding the change, what they expect next, etc. Also gather information about what changes are planed next, i.e., what’s the next milestone in a organisational restructuring project, or in the roll out of a new process or IT system. Ask about who’s most impacted by the next milestone and how they have been prepared for it, if at all. Ask these impacted employees, how well prepared they feel. Usually we gather this information by means of interviews, focus groups, or online surveys. Based on the information gathered you can start developing hypotheses about what is really going on, what is needed next, and what interventions might help to achieve the desired outcomes. Maybe people told you that they are unclear about what is expected of them. Maybe they have open questions which need to be answered. Maybe you get a feeling that they resist the change because they are unclear about next steps. Maybe you come to the conclusion that what is really needed is an intervention to create energy and trust into the initiative. It is best to develop hypotheses in a team. Discuss perceptions, experiences, and what might make people act the way they do. Keep on asking why you think people said this or that during your interviews above. Your hypotheses should guide your next step. Think about what you’d like to achieve, what people need, and which interventions could be functional to achieve this outcome. Sometimes, especially when working with a larger group of people, e.g., a whole department or even a whole company, you might need to consider a series of various interventions. Let’s assume for example that during a post acquisition integration you surveyed all employees about how they feel about the current state of the integration, and which questions and concerns they have. You might launch a communication campaign to answer their questions. You might also need to engage with management to develop answers to questions, equip them with communication tools and materials, so they can provide answers, hold a series of meetings to give workers the possibility to discuss your answers, etc. Jason Little, author of “Lean Change Management” adds an interesting perspective to designing interventions. He suggests developing options and run experiments of interventions to see what yields the best result. I’m pondering the idea, although I would probably not recommend it in every case, as a failed experiment could potentially harm your stakeholders’ perception of and feelings towards the change considerably and do more harm than good. To close the loop, you need to evaluate the outcomes of your interventions and ask yourself, whether you’ve reached your objectives and, again, what is needed next. This evaluation is similar to the gathering of information in the first step. The information gathered serves again as the basis for formulating hypotheses about what the current situation is and what interventions are needed next. You might not have achieved the desired outcome and might need to try a different approach. Following the above example, you might conduct another survey after 1–3 months of having implemented your interventions. Or you might have a sense that your did not reach your objectives right after having conducted a workshop, and need to take a next step immediately. The most important thing is to stay close to the people involved in the change, and don’t automatically assume your interventions were successful and had the intended effect only because you implemented them as planed. As mentioned above, the principles of how this particular school of systems thinking approaches change and leadership, are very similar to those en vogue today in design thinking, agile, lean, etc. Only these system thinkers have been around since the late 1980s. Recently I’ve also been made aware of other schools of thinking, like the OODA loop for example, which were invented around the same time, and are build on similar principles. Think before you act. Observe, collect information, and oriented yourself based on hypotheses about what is going on and what is required. Design interventions with purpose, build on these hypotheses. Don’t assume that because you acted, you achieved the intended result. Learn from outcomes achieved to refine your hypotheses and repeat the cycle. Marc has built and delivered corporate strategy, innovation, and transformation programs around the globe. Co-author, The Art of Opportunity, he is a member of the global Educator Network of Duke Corporate Education.